For the past decade, bee colonies have been dying off in high numbers. A new study suggests the widely used herbicide Roundup may be playing a role. The research, published in the journal Proceedings of the National Academy of Sciences, finds that honeybees exposed to glyphosate, the active ingredient in the Monsanto weed killer, lose some of the beneficial bacteria in their guts, thereby becoming more susceptible to infection and death from harmful bacteria. 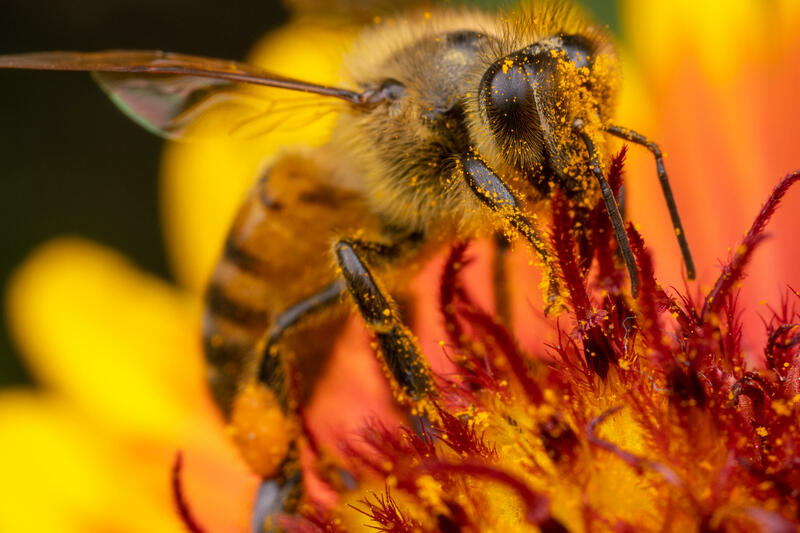 The researchers from the University of Texas at Austin say that the findings suggest that glyphosate may be contributing to what's been dubbed "colony collapse disorder." The name refers to the mysterious disappearance over the past decade of bees in the United States. Experts have offered several theories for the phenomenon, including exposure to pesticides or antibiotics, habitat loss and bacterial infections. This latest research adds herbicides as a possible contributing factor. "We need better guidelines for glyphosate use, especially regarding bee exposure, because right now the guidelines assume bees are not harmed by the herbicide," Erick Motta, a graduate student who led the research at from the University of Texas at Austin, said in a statement. "Our study shows that's not true." It has been long assumed that glyphosate is not toxic to animals, including people and bees, because it interferes with an important enzyme found in plants and microorganisms, but not in animals. The researchers decided to test if glyphosate could be harmful to bees in other ways. For the study, they exposed honeybees to glyphosate at levels known to occur in crop fields, yards and roadsides. The bees' backs were painted with colored dots so they could be tracked and later recaptured. After three days, the researchers found that the herbicide significantly reduced healthy gut microbiota in the exposed bees. Specifically, of eight dominant species of healthy bacteria, four were found to be less abundant. The hardest-hit bacteria species, called Snodgrassella alvi, is a critical microbe that helps bees digest food and defend against pathogens. The bees with the affected gut microbes were also far more likely to die when exposed to infectious pathogens compared to their healthy counterparts. "Studies in humans, bees and other animals have shown that the gut microbiome is a stable community that resists infection by opportunistic invaders," said Nancy Moran, a professor at the University of Texas at Austin who led the research alongside Motta. "So if you disrupt the normal, stable community, you are more susceptible to this invasion of pathogens." In a statement, Bayer, which purchased Monsanto earlier this year, notes "no large-scale study has ever found a link between glyphosate and honey bee health issues." "A new paper published in the Proceedings of the National Academy of Sciences does not change that," the statement continues. "This paper links the use of glyphosate to gut microbe problems in honey bees. The paper does not provide any evidence that the purported effects could have a negative impact on bee health under realistic field conditions." Bayer also questions "whether the concentrations of the substance tested could at all be absorbed by bee populations in the open over a relevant period of time" and points out the "relatively small number of individual bees which were tested." According to the study, the research included hundreds of adult worker bees from a single hive. In light of the research, Motta and Moran recommend farmers, landscapers and homeowners avoid spraying herbicides containing glyphosate on flowering plants that bees are likely to visit. "It's not the only thing causing all these bee deaths, but it is definitely something people should worry about because glyphosate is used everywhere," said Motta. Moran notes that while the study only included honeybees, bumble bees have similar microbiomes and would likely be affected by glysophate in a similar way.